One week ago today was the third anniversary of my tumble off that decrepit third-world iron bridge. I woke with an abundance of gratitude and prayers already spilling from my heart. This time around, this particular January 25th, however, proved to be memorable for an entirely different reason: Laying down the last stones of the labyrinth. 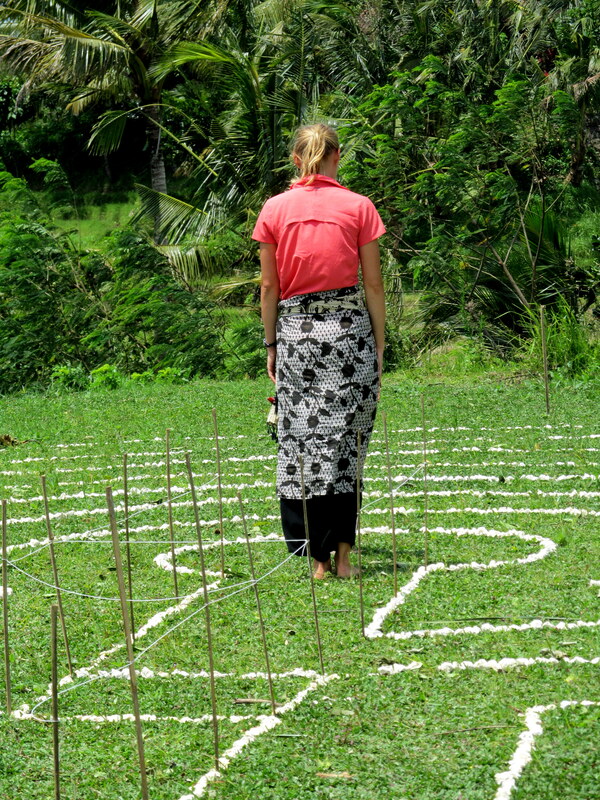 When I arrived in Ubud, almost nine months to the day before, I was excited at the prospect of finding and walking around labyrinths. Ubud is, after all, the center of healing in Bali. I was certain that I would find a plethora of labyrinths around the island, oases of peace scattered here and there, surrounded by the tropical sights and sounds of nature. 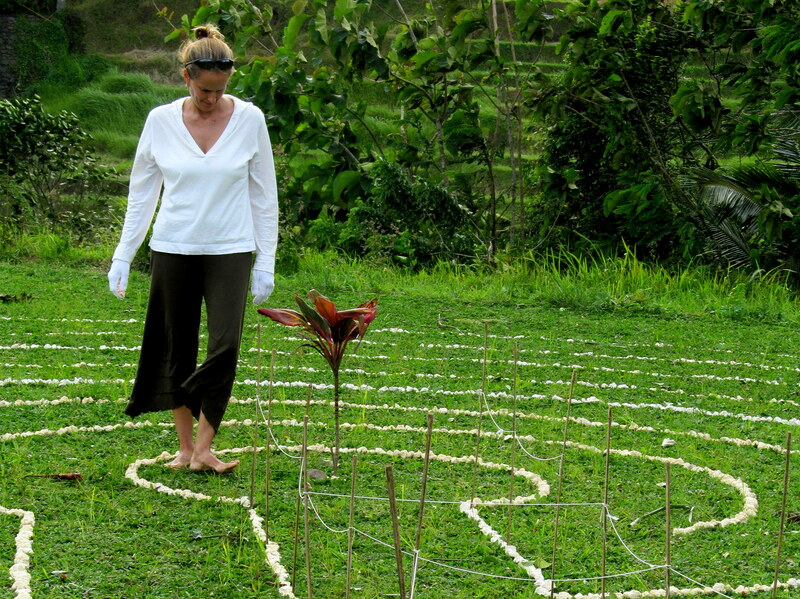 And so, at P’s invitation, I jumped at the chance to design and create a labyrinth at her still-under-construction meditation retreat center. In Tabanan. In the shadow of Mt. 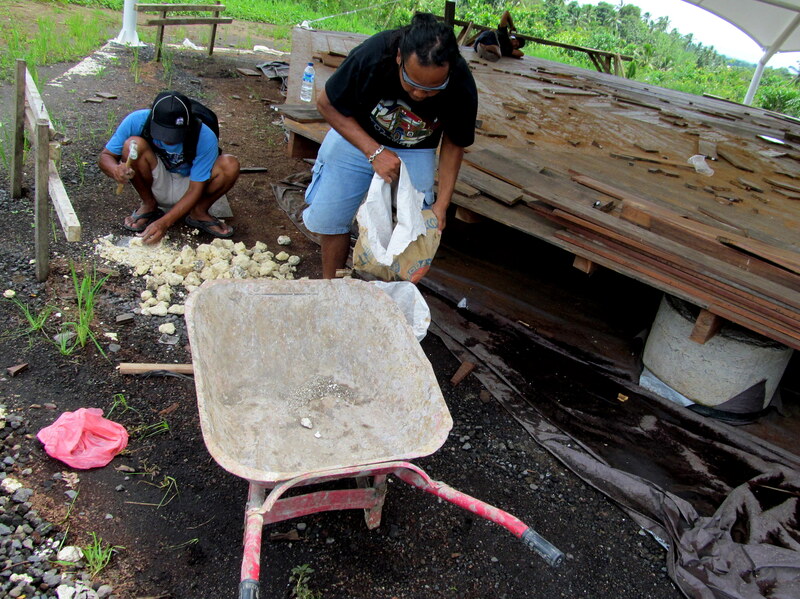 Agung and Batukaru. 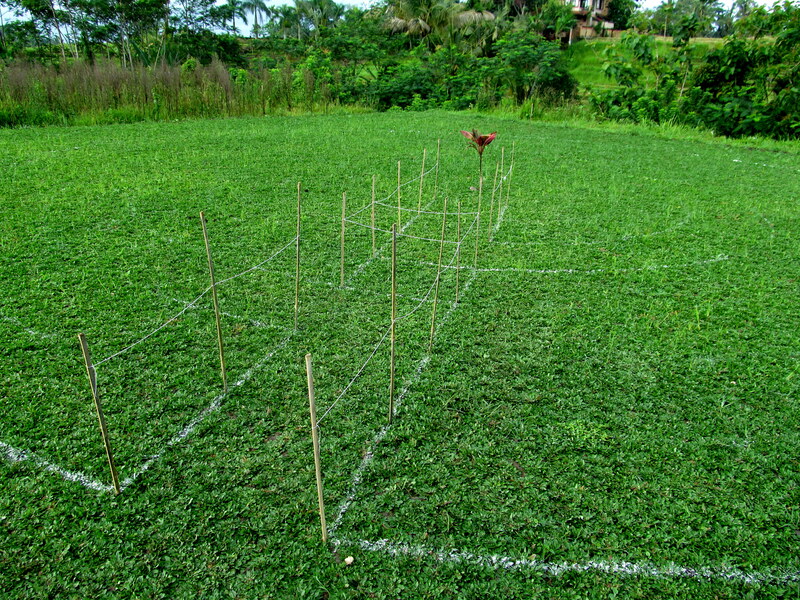 Using planted grass, inlaid with limestones marking the borders of each circuit. To be bordered by an octagonal-shaped perimeter of plants and flowers. It quickly became apparent that, like ra ising a child, it takes a team (or village?!) to bring a labyrinth to life. Which is what I had: P herself (the center’s indefatigable dreamweaver); J avanese laborers; Balinese foremen and project managers; an American couple with a passion for solar heating, bamboo buildings and gardening; an American chaplain – and the lady spirit who lives among the trees above the temple in the jungle patch just off to the side. Not to discount the others, but the lady spirit provided critical guidance as to the importance of weeding and and why one must pay close attention and get out of the way – to avoid being knocked over by a large mass of tree about to barrel across the labyrinth. Through days of blistering sun, rain and unrelenting wind, we finally pulled it off. Finally, a gift to P’s and my own dream come true; for silent reflection, walking meditation, peace. 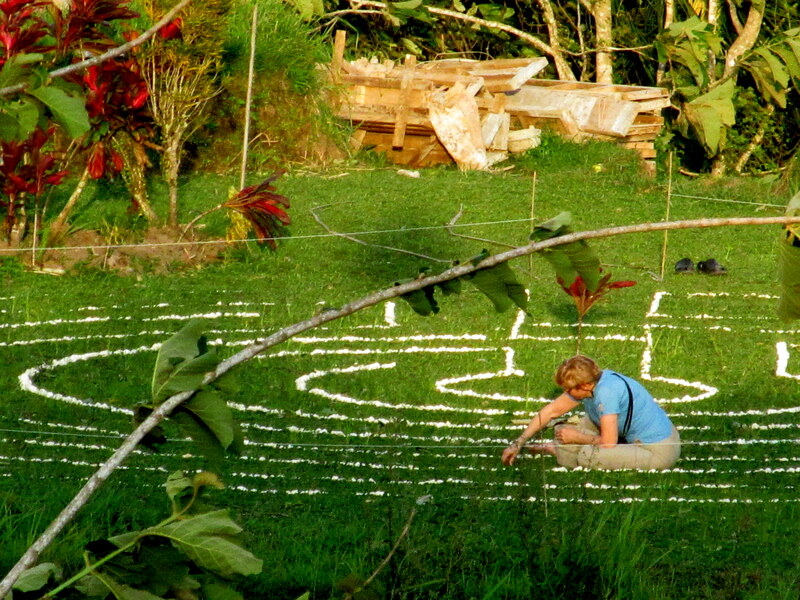 Which is how a labyrinth began to grow right here, on Putu’s patch of land, in one small corner of this little island of the gods. I read this article in a magazine a few months ago, I love walking labyrinths. Would it be possible to come for a visit to meditate and walk it? Hi Emilie, Thanks for dropping by. 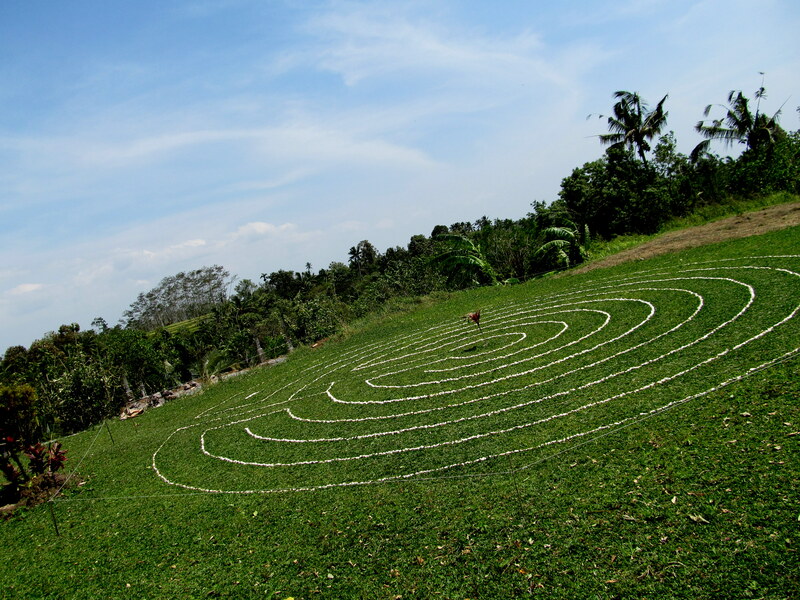 I’ll send you an email with info about the retreat where you can visit the labyrinth!